Pietrina Tripi first appears in the Painesville, Ohio, area in 1921. In America, Pietrina Tripi was known by her married name, Pietrina Dolce. Pietrina Tripi, daughter of Angelo Tripi and Carmelita Nasca, was born on December 15, 1900, at Montemaggiore Belsito, Sicily, Italy. She married Calogero Dolce, son of Filippo Dolce and Rosalina Nasca, in 1920. Pietrina died on January 26, 1988, at Hallandale, Broward County, Florida, at age 87. Her body was interred at Riverside Cemetery at Painesville, Lake County, Ohio. Pietrina Tripi immigrated to the United States in 1921. 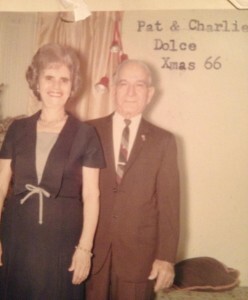 Pietrina and her husband, Charles Dolce, owned and operated Service Star Market at the corner of Jackson Street and St. Clair Street in Painesville from 1920 to 1959. They moved to Hallandale, Florida, in 1959. Pietrina’s brother, Mariano Tripi, migrated to Painesville about 1915. 1. Phillip Dolce was born on July 21, 1921, at Ohio. Phillip died on September 6, 1959, at age 38. His body was interred at Riverside Cemetery at Painesville, Lake County, Ohio. 2. Rosina J. Dolce was born on April 16, 1924, at Painesville, Lake County, Ohio. Rosina died on May 30, 1928, at 336 Owego Street, Painesville, Lake County, Ohio, at age 4, because of intestinal influenza and pneumonia. Her body was interred at St. Mary Cemetery at Painesville Township, Lake County, Ohio. 3. Carmella Dolce was born in 1928, at Ohio. 4. Madalyn Dolce was born about 1932, at Ohio. 5. A. Charles Dolce was born about 1935, at Ohio. 6. David Dolce was born about 1938, at Ohio.